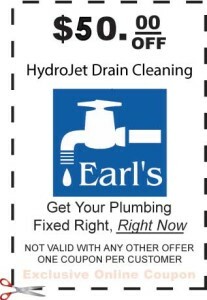 Earl’s Plumbing is proud to offer residential hydrojet services and commercial hydrojet service. Hydrojetting is quickly becoming the favored method of drain cleaning. Instead of using a mechanical reel from a typical drain snake, hydrojetting uses pressurized water to clean your drains. Hydrojet drain cleaning allows your drain lines to be 100% clean. Our plumbers utilize state-of-the-art equipment and go through advanced training to clean your drains fast and effectively. Hydrojet drain cleaning offers many benefits over tradition drain cleaning techniques. Long Lasting: A conventional snaking machine only clears a small hole through the clogged pipe. Residue on the insides makes it easy for debris to collect, eventually clogging the pipe again. Pressurized Clean: A hose with pressurized nozzle is run down the drain line. Water is then “jetted” forward through the run, clearing debris and rinsing the inside of the pipe. Clean Drain Guarantee: All hydro jetting is backed by a 90 day warranty against stoppages. 100% Effective Drain Cleaning: Cleans a full 360 degrees of your drain lines. It is essentially pressure washing the interior of your drains line for 100% effective clogged drain relief. Safe for all types of drain lines: for your business and your home. Economical Drain Cleaning: With hydrojet drain cleaning, your clogged drains are 100% cleaned. This allows for longer intervals between your drains clogging up. Commercial Hydro Jetting Services in Chico. Earl’s Plumbing commercial hydro jetting services utilize state of the art trailer jetters to keep your business up and running. Eliminate grease and blockages that slow your drains. We offer one time commercial drain cleaning as well as scheduled maintenance. Let Earl’s Plumbing take care of your drains so you can focus on running your business. Specialized for commercial applications such as restaurants – get rid of that grease build up. Annual, Bi-annual, and monthly drain cleaning subscriptions available. Flexible commercial drain cleaning – schedule during your business’s downtime to prevent loss of revenue.